"The owners are extremely nice and genuinely helpful. Decent housing for Nazca. Good value for money. I recommend it." 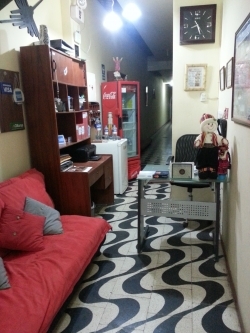 Ancalla Hostel is a little accommodation located just in the downtown of Nazca. It has 14 rooms that are single, double, and of three rooms. Each of them have a private bathroom, amenities, cable tv and free wifi. You can find a restaurant in the hostel surroundings that offers delicious typical dishes, continental breakfast with regional products, included in the price. The hostel gives laundry service, luggage storage, and service transfer to the airport which is less than a quarter hour. If you come to Ancalla Inn, dont’s forget to visit the Archaeological Museum and fly over the Nazca lines. 24 hour reception Check In: 01:00 p.m. Check out: 11:30 a.m. The cancellation or modification of the reservation must be made at least 72 hours before the arrival date. In case of violation of the Cancellation Policy setting may make the payment of one night of lodging apart from the already paid deposit as collateral. In case of no show the housing (not show), the setting may make the payment of 100% of total reservation already paid part of the deposit as collateral. To change your reservation please contact directly the Hotel whose contact details appear on the voucher. If you request a modification to reduce the number of nights or rooms not reimburse the security deposit is not taken into account for the payment of the modified reservation. "Angela was very nice. She helped us a lot with a lot of things. We only stayed at the hotel for a few hours but the hot shower and the breakfast was totally worth it." "Very noisy: rooms have windows into the common corridor and roosters start crowing at 4 am"
"Very friendly and helpful staff. Breakfast was good. Safe parking nearby. Very good value for the money." "The windows open to the corridor. There was no special room for breakfast."